Efficient thermal and sound insulation. 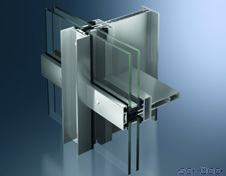 TRU Curtain Walls deliver the ultimate in window design and engineering. The narrow face widths of these systems provide transparency, and accommodate almost any building type thanks to their timeless design. Our single system platform means our Curtain Wall seamlessly integrates with other TRU systems. Fabrication is streamlined by reducing the total number of individual parts to be processed and using similar parts. The systems are suitable for commercial and institutional applications, and custom curtain walls are available in a virtually limitless array of sizes and configurations. TRU can accommodate exceptionally large openings that do a great deal more than look spectacular - they control light, temperature, and noise. Quick and easy installation process with dry gaskets. Integration of Photovoltaic facades for energy generation.